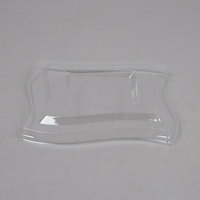 The wavy lines of these plastic bowl lids will attract customers' attention, and the clear color will help improve product visibility and boost impulse sales. 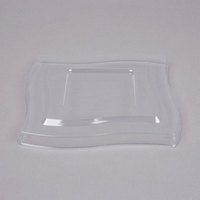 Sell pre-portioned salads, pastas, or entrées in wavy bowls and cover them with their compatible plastic lids so customers can see products in your display case. 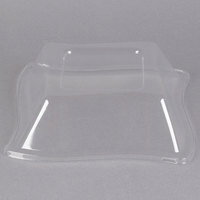 We offer flat and dome shape lids, so you can choose the appropriate lid for the food item you're serving. 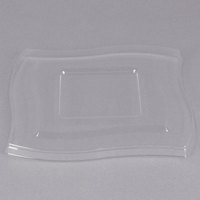 Dress your take-out items and leftovers to impress with these disposable plastic bowl lids. 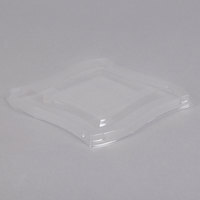 The wavy lines and clear color of our lids grab the attention of customers and help them see your pre-packaged products. 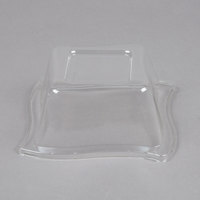 The secure fit of each lid also makes them a practical option for guests bringing leftovers home. When your guests are done eating their take-out or leftovers, they can simply throw the lid away for easy clean-up. Don't forget to include plastic flatware and paper napkins in your take-out bags so your guests can continue to enjoy your dishes once they leave your establishment. 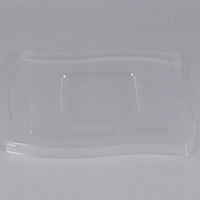 If you're wondering where to buy disposable plastic bowl lids, we have a large selection of disposable plastic bowl lids for sale at the lowest prices.